Consider these words from a Prime Minister: ‘… whether I am a writer or not, I am an admirer of writers and I think that they perform not only a useful but an essential function at any time…’ The writer performs a function that is essential to the country; and the country, we find out from the same Prime Minister’s words, include both the citizenry, of which a writer is a part, and the state. This is one central point made by Jawaharlal Nehru in his Inaugural Address at the Fourth P.E.N. All India Writers’ Conference in Baroda in 1957. It can be a little hard to believe this today, but we had an India in which the Prime Minister could discuss rationally, in a public gathering, what a writer is, and what the state and writer have to do with each other. 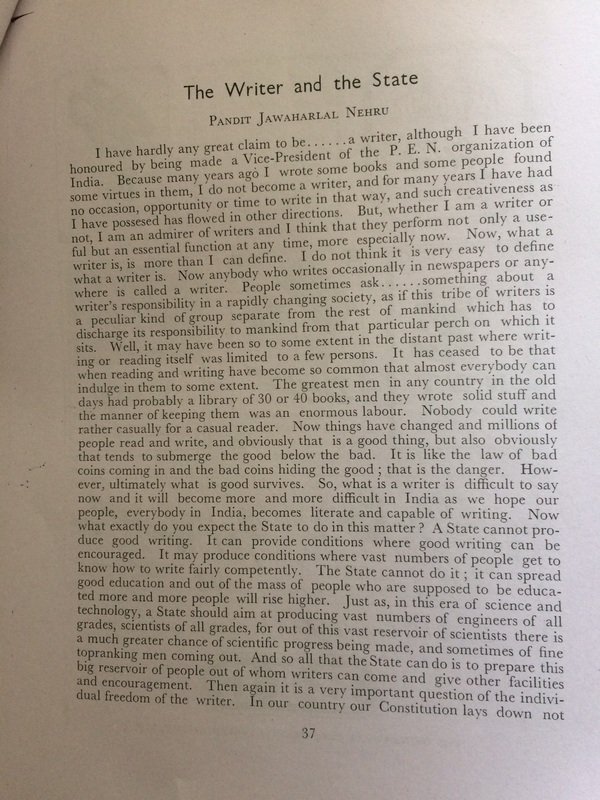 In times of censorship through intimidation, and the tacit or open support of the state and its ideological allies, it’s useful to recall what Nehru had to say about the ‘important question of the individual freedom of the writer’ in his 1957 address. 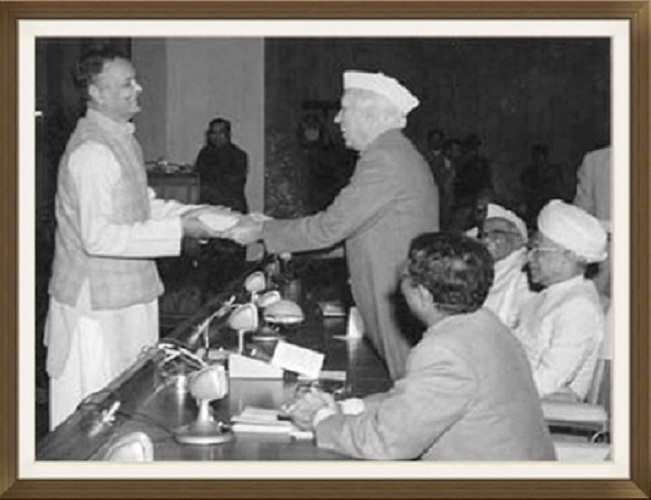 Nehru was clear that this freedom was critical; equally critical was the relationship between the state and the writer. 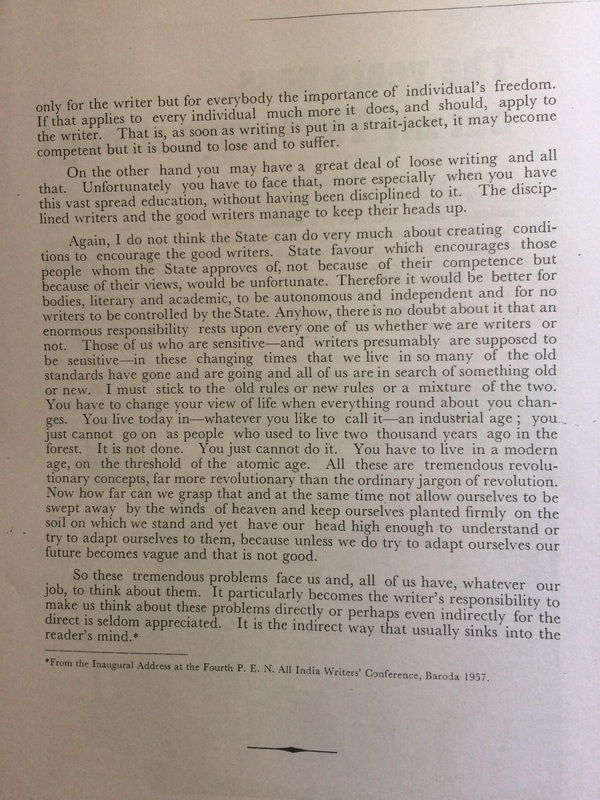 The state must encourage writers, but not act as an arbiter of what is adequate, ‘competent’, ‘good’ or ‘bad’ writing. And writers and literary bodies have to be autonomous; the state has no business to interfere in these bodies. Nor, Nehru may have added, if he could have seen where these cultural institutions are today, should they toe the line of the prevailing ideology of the day. We have not heard any views on writers and their role in society from the present Prime Minister, Mr Modi. But we have, alas, heard from his official and unofficial teams. In other words: writers and the government have nothing to do with each other. Possibly they live on two different planets. Clearly, Mr Sharma and Nehru also come from two different planets. Worst of all is the hatred against criticism, debate, dissent and imagination we see today, the fear of all the traits so valuable to writers, readers and citizens. Nehru’s 1957 Inaugural Address is one small signpost to remind us of who we are, and where we come from. The India that Nehru, and we, as citizens, assumed, not just as a vision, but as a reality: it is not really gone. It cannot be gone, because we will not let it go. We will make more rebellions, on paper, on image and celluloid. We will read, write, sing and paint them. We will take them to the streets.